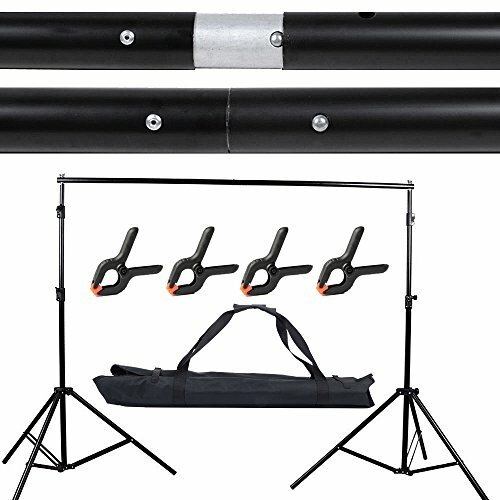 This brand new portable background/backdrop support stand kit is extremely suitable for all level photographers from amateurs to professionals. It is a perfect solution to produce photo and video for web retailers and commercial product catalog, especially for costume and portrait. Very easy to use and set up in minutes. High quality & light weight aluminum stand; Professional Aluminum Alloy Construction for Durability and Portability. Easy to assemble and disassemble; Four section connectable cross bar and making simple to adjust the width. Perfectly hold muslin, paper and canvas; Provided fast precision height adjustment with single action lock. Carrying Case: Built-in small pocket for instruments; Portable and convenient to anywhere; Suitable for one set of background support stand.